Originally founded over a century ago by John Watson and joined by John Smith in the 1950s, Watson Smith has been a world leader in the design and manufacture of specialist pneumatic instrumentation for over twenty years. The factory is based in Leeds, LS6 2RT, England. Watson Smith are dedicated to the development of precision instruments, interfacing flexible control systems with a diverse catalogue of pneumatic technologies. Coulton Instrumentation is proud to be the No.1 distributor for Watsom Smith products worldwide. Watson Smith develop and provide process and fluid control solutions to the world's leading process OEMs, distributors and end users. 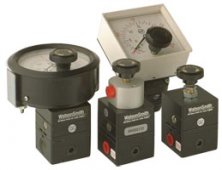 As the electro-pneumatic centre of excellence, Watson Smith Instrumentation products offers a complete range of precision regulators, electronic regulators, electro-pneumatic converters as well as simple pressure transmitters and meters. Based in Leeds, LS6 2RT England, Watson Smith factory is ultra reactive and able to supply products of the highest quality.